the author and finisher of [our] faith. Tickets will not be available at the door. They may be purchased unto July 2nd at www.orthodox.net. Parishioners are also asked, if possible, to help provide the complementary refreshments during the talk. Emails have been sent out to the St. Julianna Sisterhood list with suggested menu items that need to be provided. If you have any questions, contact Elaine King. . The brotherhood (and everybody else who is interested) is reminded that Saturday, July 4th is the feast day of our brotherhood patron, St. John of San Francisco. We will have Vigil Friday night and Liturgy Saturday morning, and a brotherhood meeting over lunch. If you can give a few hours of our time to help care for God's house, please contact Matushka Marina, Reader David or Deacon Nicholas and we'll tell you how you can help. The Fast of the Apostles begins on Monday, June 20th! Our Lord said of his disciples that "when the Bridegroom is taken away from them, then they will fast." The Paschal period is over. The Holy Spirit has come. The feast of All Saints has challenged us to "run with patience the race that is set before us," in obedience to our Lord's command to "be perfect, as your Father in heaven is perfect." And one necessary tool in our struggle to conform ourselves to the Image of Christ is… Fasting with Prayer. The fast of the Holy Apostles will continue until the Feast of the Apostles Peter and Paul on June 29 / July 12. During this time, we abstain from meat, dairy and egg products. Fish is eaten on weekends only. Wine and cooking oil are used on Tuesdays, Thursdays, and certain days in honor of major saints. This week, Fish will be allowed on Friday in honor of the Holy Apostles Bartholomew and Barnabus. "Blinded in the eyes of my soul, I cry out to Thee, O Christ, like the man blind from his birth, and in repentance I cry to Thee: Thou art the exceeding radiant light of those in darkness!" And He brings enlightenment and peace to all who desire it — to all who turn away in disgust from the darkness that so often besets us, who flee to Him with tears, who repent of the many poor choices we have made and seek redemption by His grace from the pit we have dug for ourselves! 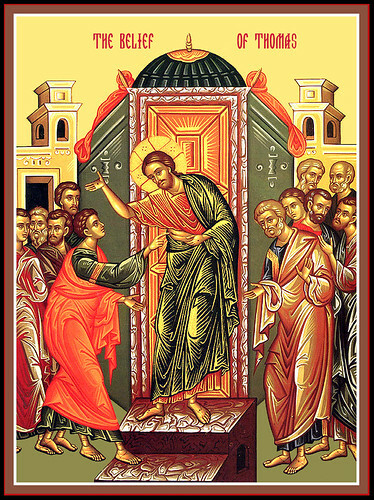 On this last Sunday of Pascha let us renew our prayer for this enlightenment, knowing that He will not delay to grant us our desire. And so let us meet the holy feast of His Ascension with joy, knowing that He raises us with Himself! Sunday 5/29 Sunday of the Blind Man. Thursday 6/2 Ascension of the Lord. Assembling, O ye who love the feasts of the Church, / let us hymn the adornment of hierarchs, / the glory of the fathers, / the well-spring of miracles / and great defender of the faithful, saying: / Rejoice, O protector of Myra, / honored primate and steadfast pillar of its Church! / Rejoice, O most radiant beacon, / illumining the ends of the earth with wonders! 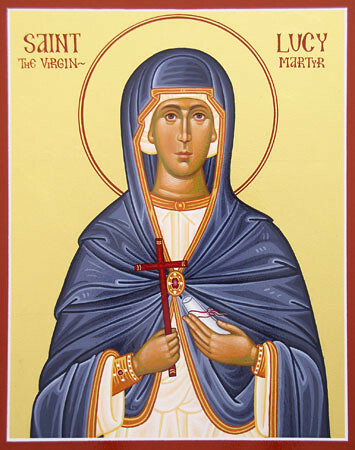 / Rejoice, divine joy of the sorrowful / and fervent intercessor for the oppressed! / And now, O blessed Nicholas, / cease not to entreat Christ God / in behalf of them that honor thine ever-gladsome and most illustrious memory // with faith and love. Saturday 5/21. St. John the Theologian. 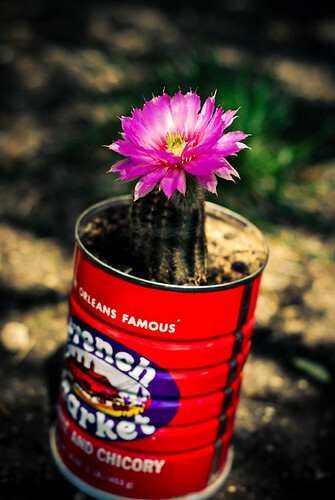 Cactus flower, which appeared during Bright Week. "As the disciples were in doubt, the Saviour came on the eighth day to where they were gathered and granted them peace, and cried to Thomas: Come, O Apostle, and feel the palms in which they fastened the nails. O good unbelief of Thomas, which hath lead the hearts of the faithful to knowledge! Hence, he cried out with fear: O my Lord and my God, glory be to Thee." We mustn't despair when we struggle and continuously see nothing but the slightest progress. We all do nearly nothing, some a little more, some a little less. When Christ sees our little effort He gives us an analogous token and so our nearly nothing becomes valuable and we can see a little progress. For this reason we mustn't despair, but hope in God. We are in the midst of our fall stewardship campaign. Please remember to fill out your pledge form as soon as possible (a copy is included at the end of this newsletter) and return it to Dn. Nicholas or place it in the donation box. Our treasurer has the task of preparing a preliminary 2011 budget proposal to present at our December 4th church council meeting. More information on our expected income would make this task easier, so please return your form as soon as possible. Every year on the Sunday after Thanksgiving, we take up a collection for the diocesan fund for the needy. This fund provides Bishop Peter with the money he needs to help those who come to him seeking financial assistance. Please make an effort to contribute to this collection! Class for those interested in learning how to serve weekday Vespers/Liturgy, 8:15pm. Saturday, 12/4. Entrance of the Theotokos into the Temple. (If monthly) We will usually pay our pledge on or about the ____________ Sunday of each month. Please return this form to the treasurer, Dn. Nicholas, or place in the donation box at church. "Since we have been baptized, let us take care that our soul remains swept and garnished but never empty. Our soul should always be filled with the Holy Spirit and then the evil spirit, when he comes anywhere near us, will be filled with fear and will not be able to enter us." – From "Redeeming the Time." See the entire post here. Our new facility brings with it new maintenance and upkeep tasks. The main venues for keeping our church beautiful are the sisterhood under the leadership of Matushka Marina and the brotherhood under the leadership of our Warden, Reader David Hawthorne. New members, and more active old members, are always welcome! Please help! We have again updated and prioritized our list of things our parish needs. If you or somebody you know wish to supply one of these items, please contact us. We will not be holding our usual Tuesday Vespers, Wednesday Liturgy or Thursday Molieben this week, since Fr. Seraphim will be at the St. Peter the Aleut children's summer camp. This Saturday is the commemoration of St. John of San Francisco, the Wonderworker, a great saint of our century and our land, and the patron saint of our parish brotherhood. We will hold services Friday evening and Saturday morning. Dr. John Johnstone. 6/4 ns. 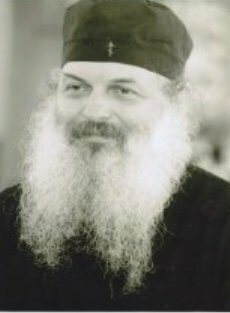 "Herr Doctor" was a dear friend of Fr Seraphim and family in St Louis. He was about 90. Liturgy for St. John of San Francisco, 9am. Brotherhood meeting following the Liturgy. This week, Fish is allowed on Monday (in honor of St. Jonah of Moscow) and Friday (in honor of the Apostle Jude). You are currently browsing the archives for the Local announcements for the St Nicholas parish family category.